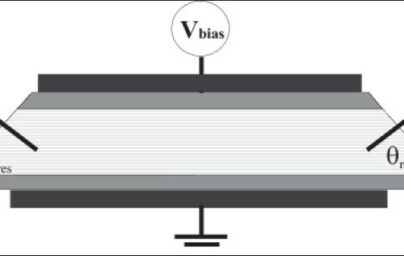 Top panel: rate of emitted photons as a function of the modulation frequency. Bottom panels: the spectral density (arb. units) for the processes A, B, C, respectively. Luminescence spectrum from a photon/polariton condensate in a planar cavity. 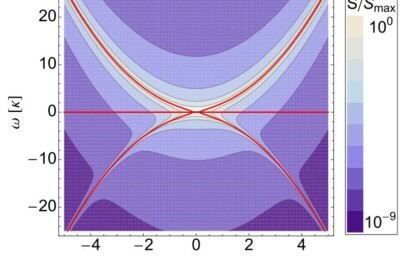 Theoretical image of the density correlation pattern in a flowing Bose-Einstein condensate displaying a sonic black hole horizon emitting phonons by analog Hawking emission. The BEC Center involves staff researchers of INO-CNR (a national research institution in optics) and of Trento University. It is located in the village of Povo, in the suburbs of Trento in north-east Italy. The BEC Center now hosts around 30 researchers. Since the mid-90’s the BEC Center has played a key role at the highest international level in the theoretical studies of quantum gases of ultracold atoms. Sandro Stringari, the founder of the center, and Lev P. Pitaevskii, appointed to the center, are among the most renowned scientists in this field. 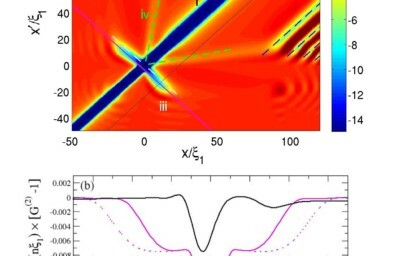 With the hiring of Iacopo Carusotto in 2003 the BEC Center has opened a new research line in quantum optics, with a special interest in the many-body physics with photon and polariton gases. Since then, the BEC centre has earned a world-class leading position also in this novel field, with a wide network of experimental and theoretical collaborations and international collaborative projects: Its most active research lines related to the MIR-BOSE project include polariton condensation with inter-band and inter-subband polaritons, quantum vacuum effects of the photon and the polariton fields, analog models of curved space-time quantum field theories with optical and condensed-matter systems, quantum hydrodynamics of quantum fluids of light. The combined expertise in degenerate quantum gases and in quantum optics and the regular common activities make the BEC Center the ideal institution where to carry out an interdisciplinary research involving many-body of atoms and of photon/polaritons.